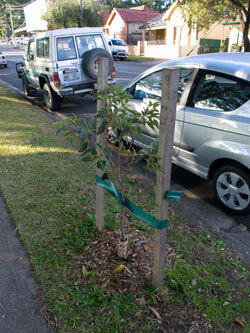 This young street tree has a fighting chance of surviving because it is planted in a grassed area. Still the odds are very much against it. When I posted these ideas I had some anxiety as to whether I was asking too much of the community & whether the community would even consider taking part if such programs were in place. Randwick City Council also prunes trees when needed & ask residents to notify them if they think a street tree needs pruning. I have written a couple of times that I think dead or dying branches of street trees could be pruned before they fall as this is a normal cycle for trees. 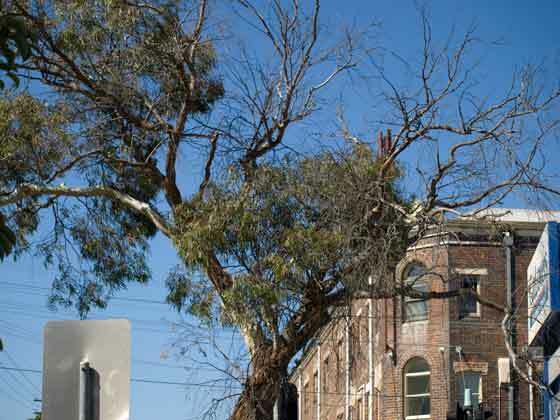 I think in Marrickville LGA, if a street tree drops branches, they are marked as dangerous trees & put on the death-row list. I tend to write about trees as issues come up & then research the issue. This approach works for me because the urban forest is a big subject & any research generally has to be specific. Today I Googled ‘Adopt a Tree Programs’ & found that this is being done by a number of Municipal Councils in Australia & overseas. Some examples follow. I have quoted directly from their website & bolded particular points because they impress me. Moonee Valley City Council. Launched in 2006, the Adopt a Tree program invites residents to care for a street tree during this period of dwindling water supplies. Parents of adopted trees will get an official adoption certificate, a bucket & a litre of environmentally-friendly laundry liquid. Wollongong City Council. 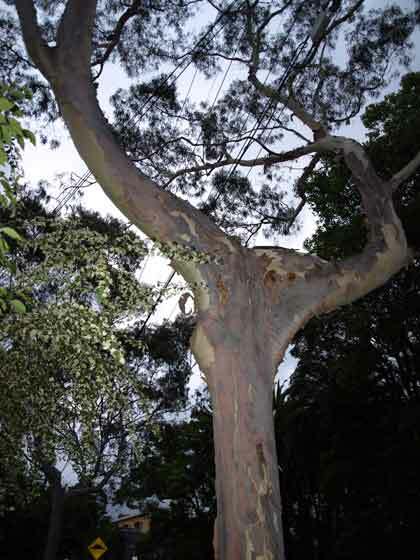 Since its State pilot in Wollongong during 2003… Other residents interested in planting more native trees in their own yards can take advantage of Council’s Greenplan which offers 5 trees for $15. The City of Unley South Australia. 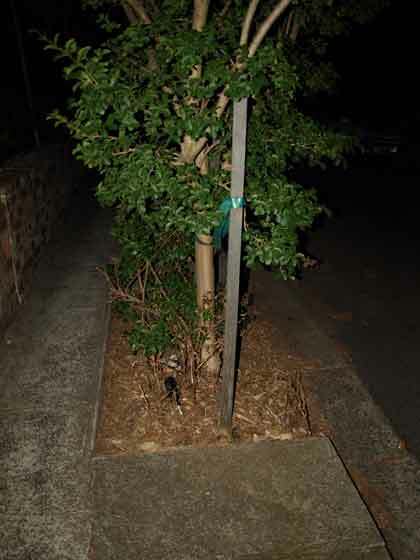 Currently the Council provides a bucket and fact sheet to residents when a new street tree is planted. 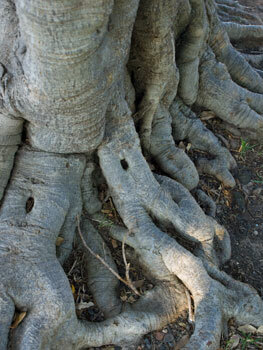 The fact sheet provides some detail as to how the resident can assist by watering the tree in its formative years. 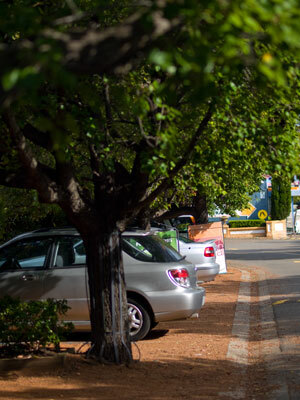 Part of the strategy relates to Unley’s street trees, & includes a recommendation that the Council launch an Adopt a Tree program. Contribution to property values (trees in the metropolitan area contribute 13-20% of property value), & potential for contributing to higher profits for businesses. 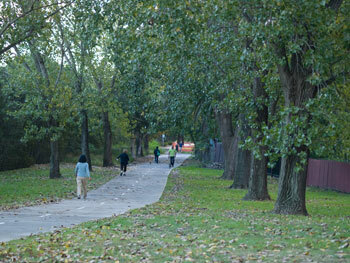 The monetary value of Unley’s 22,000 street trees is estimated at approximately $150.2 M (Burnley Method). To remove a tree costs on average $1000, and to replace costs $200. The University of Melbourne. Although the University of Melbourne is not a Council, I have included them here as their Adopt a Tree Program assists Melbourne Councils. 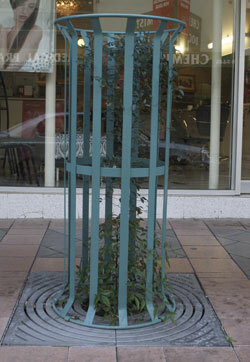 Planted in paving, under an awning, all the odds are against this tree surviving unless it is cared for. 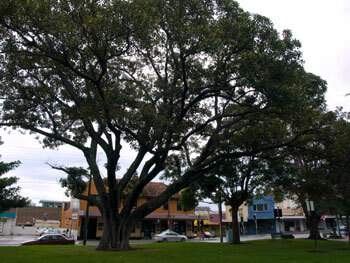 I wish Marrickville Council would follow these other Councils & set up an Adopt a Tree Program. It may not take off immediately, but it may prove popular. Needless to say, all programs need time for the community to get to know about & decide to get involved. Even if it did only amount to a couple of hundred households/businesses participating during the first couple of years, at least 200 trees or more a year could be helped to survive. This is significant, as Council plants up to 500 trees a year. 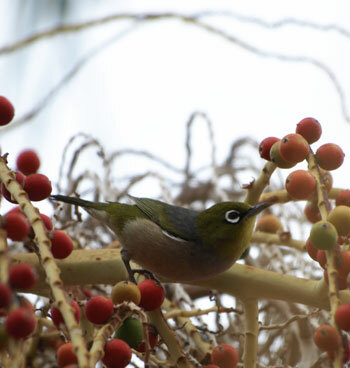 This months Festival of the Trees is looking at food for wildlife. 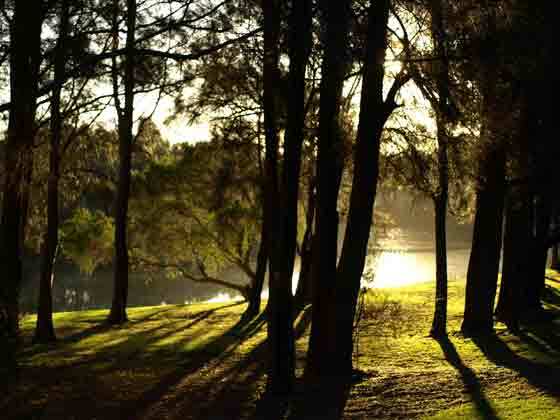 Marrickville LGA has quite a lot of wildlife for an inner city urban area, especially with the Cooks River, the Tempe Reserve & Wetlands & some of our major parks. 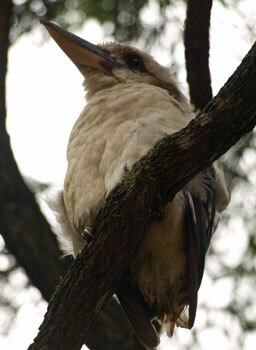 The presence of nearby Girraween Park at Wolli Creek helps our urban wildlife enormously. 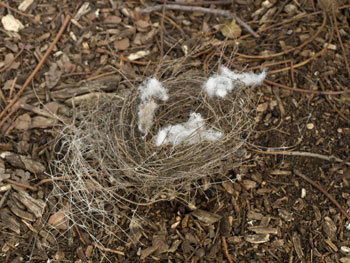 However, when we first moved into our home 15 years ago there weren’t many birds in our immediate neighbourhood. There were some of course, but we were not as aware of them as we were in our previous home. 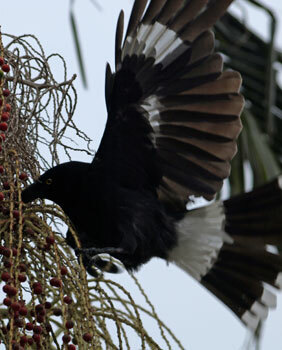 They were mostly Pied Currawongs in winter, Common Mynas all year round & a couple of Turtle Doves as well. Over the years this has changed significantly. Now birds feature strongly in our neighbourhood. So what happened to bring the birds here? The neighbourhood around us changed in that many new people moved in & they did 3 things. They removed the cement from their garden, reduced the size of their lawn or did away with it altogether & they planted trees & shrubs, many of them Natives. Some of my neighbours are spectacular gardeners converting their bare gardens into mini-botanical havens filled with a variety of bird-attracting plants. The transformation has been dramatic & they still kept the lemon tree. The other thing I noticed was that many people started putting birdbaths and/or ponds in their gardens. This combination of water & food brought the birds back in droves. It also brought the frogs seemingly by magic. We put in a pond & 2 days later a rare frog breed arrived. Now we have small frogs that hibernate under our very small piece of lawn. They wake up in summer & leave at night. We hear them, but rarely see them. At least 24 Turtle Doves live in our block now so their family extended. 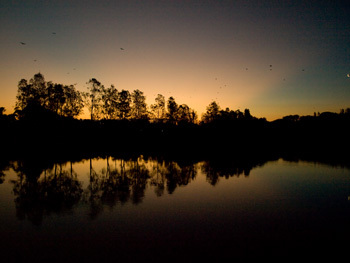 There are many White Eyes, Willy-Wag Tails, Red Wattlebirds, Magpie-larks, Australian Magpies, large groups of Noisy Miners, Red-whiskered Bulbuls, Crested Pigeons, a Common Koel or two, Grey Butcherbirds, Olive-backed Orioles, Silvereyes, Figbirds & Pallid Cuckoos. Masked Lapwings fly over-head on their way to the river. Even a couple of Spotted Pardalotes have moved in. 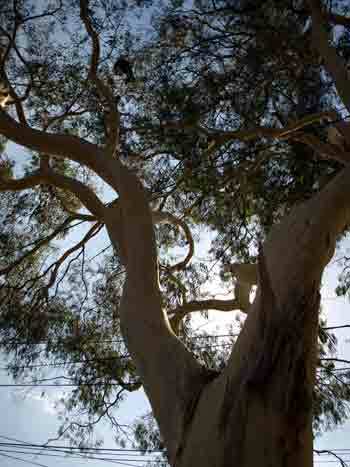 This is amazing as they live in areas with many Eucalypts, not Sydney’s Inner West. 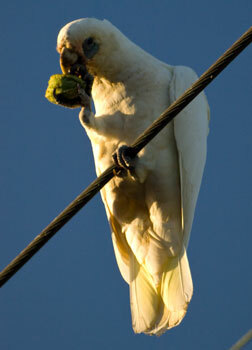 Large groups of Cockatoos fly over most days & when the nuts & fruit are ripe, they descend on mass devouring them. It’s a gorgeous sight & they are very noisy. 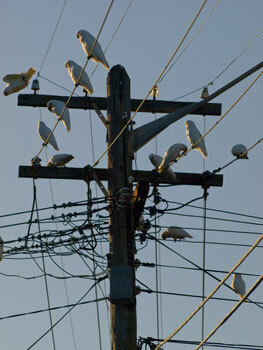 The powerlines can be covered with white birds all with something to say. Both neighbours who grow the food the Cockatoos like to eat do not mind the invasion of these birds. We still have the Pied Currawongs & Common Mynas, but they are not so destructive now they are out numbered. 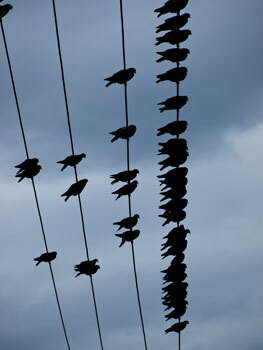 The Common Mynas tried to get everyone to move, but the sheer numbers of birds had their power reduced to almost nil. They now just get on with living. We also have native bees & a Ring-Tailed Possum or two. From a reasonably quiet area in terms of birds, our neighbourhood has become filled with bird song & bird activity. I love the change. It seems somehow more like I remember things used to be when I was a child & the presence of birds was taken for granted. Birds provide white noise that is soothing & helps block out traffic & other noises that can lead to stress. They also help you in the garden by eating the insects that eat your plants. Native plants can be used successfully with a cottage garden if that is your preferred look. Many are prolific flowerers & some have flowers all year round. Most respond to pruning allowing them to be kept in a shape you like. Pruning encourages more flowers & bushiness. From being a person who preferred cottage gardens I have become someone who would rather plant something that gives food to another. I do think the long drought we had stressed the wild birds & animals, as their water sources shrunk & their food sources didn’t flower or simply died. 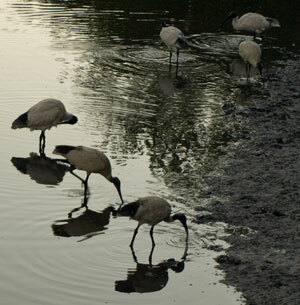 The Ibis who have decided to stay in Sydney are an example of this. Even though it’s raining torrents in Sydney & parts of NSW have flooded, the drought is not over by a long shot. 16 areas or boundaries in NSW (a little over half the state) are classified Exceptional Circumstances. 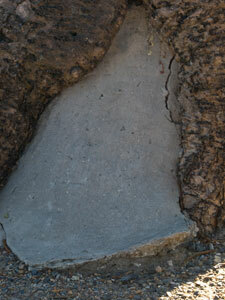 This is done when drought is regarded as severe. As a number of people have indicated they want ideas for native shrubs & trees, I’ll do some research & put together a list soon. It will be good learning for me as I am not an expert in this area either.